Price Range £189 - £280Price RangeSimply drag the slider bar to set your price range. 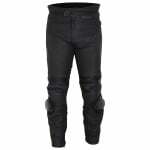 Not compromising on the quality of leather, including grade A Brazilian drum dyed, all Weise leather motorcycle jeans come with a 24 month no quibble warranty. So you can ride in style confident in the knowledge both you and your investment are safeguarded. The quality of these jeans is exceptional & the fit is perfect. I take a 34 & after reading the reviews ordered a size 34. The quality of the leather is superb & they are also quite warm. I ride 52 weeks a year for North West Blood Bikes and am out in all weathers, so am looking forward to giving them a real test over the winter. I order a lot of my clothing from the SportsBikeshop & delivery has always been the next day, even on a Sunday. I have Weise jackets and appreciate their quality and value so I wanted Weise leather jeans, which have similar good quality and zip to the jacket. 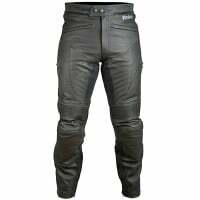 Good fit to true size, with comfort, decent quality and suitable stretch panels.. Don't need knee sliders but easily detached. I am a big fan of Weise gear and this is why! Outstanding quality at a real world price. Size was bang on, light, very easy to move in and a great buy if your in to hanging of your bike but still looks great with out sliders on. I replaced the knee padding with cup type ones as I am not a knee down guy and did not need to much flex. Great summer time jeans, top marks all round from me.